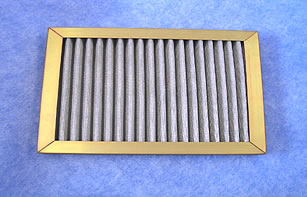 Washable dry-type P61 filters are recommended for heating and ventilation applications where higher filtering efficiency is required on fine dirt particles. Maintenance is minimal. The P61 is a surface-loading filter that should not be reversed when dirty. Filter media is non-woven polyester encased between layers of aluminum screen cloth. Deeply pleated to afford maximum dirt-holding capacity, the filter media is made from materials included in the list of fungus inert materials. The standard P61 has a galvanized enclosing channel, while corrosion resistant finishes such as chemical conversion coating or anodize are available on the special P61AA aluminum styles. Filter efficiency of the P61 ranges to 71% at face velocity of 356 fpm using standardized test dust and methods. Resistance at 356 fpm through a 2” thick clean filter is .07” H 2 O and about .08” through a 1” filter. 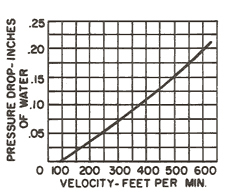 Varying velocities will not appreciably change efficiency. Standard sizes are available in nominal 1” and 2” thicknesses. Panels are available in less than 1” thicknesses on special order. The P61 can often be adequately cleaned with a vacuum cleaner. If necessary, excessive dirt can be removed by washing with water, or solution of water and mild detergent. Media dries quickly and does not require to be re-charged.